For many pool owners, million-dollar question is what is the best robotic pool cleaner on the market? Pool maintenance can often be an expensive and time consuming process that requires a lot of labor-intensive work. However, the introduction of robotic pool cleaners has revolutionized the way pool maintenance is conducted providing convenience, ease and above all a low-maintenance, immaculate pool. If you’re looking for the best robotic pool cleaners on the market based on money, rating, and service, this guide has got your covered. No matter you need the best robotic pool cleaner on the market for small pools or for large pools. We will also look at the best robotic pool cleaners for leaves and for fiberglass pools and categorize them in terms of price with a certain selection falling in the under $500 range while the rest fall under $1000 range. 1 What to Consider Before Buying? Contrary to popular belief not all robotic pool cleaners are the same. Each one has a unique set of features and functions that differentiates it from others in some way or the other. When deciding to purchase a robotic pool cleaner there are certain things that are important to consider before making a buying decision. Some pool cleaners are much heavier than others and can be extremely cumbersome to place and remove from the pool. Making sure that a robotic pool cleaner is easy to lift in order to get it in and out of the pool makes life a whole lot easier. Cords can be a nuisance when it comes to most electronics but it can be especially annoying when it leads to your robotic pool cleaner being tangled up and unable to move during pool cleaning. Buying a robotic pool cleaner with a swivel cord prevents tangles and allows your pool cleaner freedom of movement. The wider the wheels base the better it is when it comes to robotic pool cleaners. 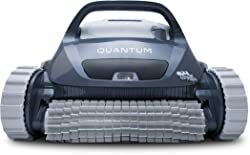 The wide base allows for better traction and rubber tires help the robotic cleaner get over bumps. It is highly recommended to buy a robotic pool cleaner with four-wheel-drive to ensure that it sticks to the sides and bottom of your pool. One of the key features of a robotic pool cleaner is the type of brushes it uses to clean off dirt and debris. 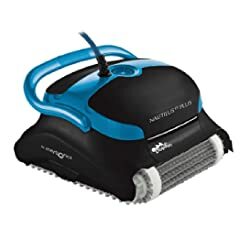 It is highly recommended that one purchases a pool cleaner that comes with hard-bristle or rotating rubber brushes as these have proved to be the most durable when it comes to scrubbing dirt and debris. A robotic pool cleaner should have excellent climbing abilities so that it can do a thorough cleaning job all around the pool including the floor, sides of the wall, waterline and even stairs. Robotic pool cleaners are expensive, and thus it is important that the one you plan on purchasing is made from tough, durable materials that can take the wear and tear of hard work. The best pool cleaners are efficient in terms of both the amount of energy they use and the number of cleaning cycles they complete in a given time period. The best robotic pool cleaners have automated features that make life a whole lot simpler. Programmable timers take away the need to manually start and shut off robotic cleaners while sensors prevent the robot from getting stuck in corners and hard to reach areas of the pool. Yes, even your pool cleaner requires the occasional maintenance and cleaning. Ensuring that the cleaning and maintenance process is fairly simple and cost-effective is also an important factor to consider when making a purchase decision. Purchasing a robotic pool cleaner that is the right fit for your pool increases efficiency which can save you both time and money in the long-run. Basing purchase decisions on the above criterion would ensure the best selection of robotic pool cleaners for small and for large pools. The Dolphin Nautilus Plus is a fully automated advanced pool cleaner ideal for a 50-ft long pool. It utilizes CleverClean technology to scan the pool and smartly maneuver itself around the floor and walls ensuring no spots are left unclean. The timer function allows the bot to run its two-hour cycle at a set schedule throughout the week. 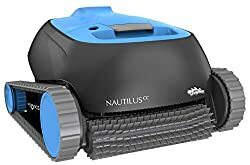 The Nautilus Plus is also equipped with dual scrubbing brushes that scrub with ferocity to easily pick up on the finest dirt providing better cleaning and water clarity. The top-loading filter is also easy to remove, rinse and reload. The Dolphin Nautilus is equipped with precision technology that intelligently scans the bottom of your pool ensuring complete coverage of the floor and walls. Although The Nautilus does not come with a swivel power cable, its software uses an algorithm to prevent its 40-ft long cable from tangling. A single powerful brush on the Nautilus is able to scrub off large debris from the surface of the pool. The filter is just as easy to remove and clean. 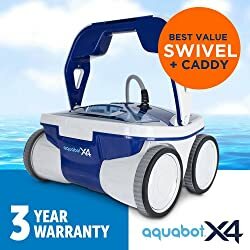 For someone who has an above-ground pool, the Aquabot Pool Rover Junior is the best investment for your money. The unit is incredibly light and is priced under $500. Its 40-ft long cable is equipped with an adjustable axle pin that helps the bot move freely on any flat-bottomed pool preventing its cable from getting caught up. The Pool Rover Jr. comes with a 24-volt pump motor that is able to filter over 70 gallons of water a minute. The ultrafine filter bag located at the bottom can pick on any micro dirt particles down to 2 microns, leaving your pool floor spotless. 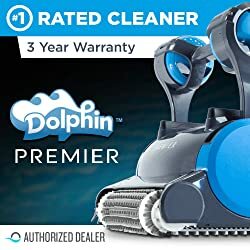 The newest robotic pool cleaner by Maytronics, The Dolphin Premier Robotic Pool cleaner (2018), isn’t here to disappoint. Fitted with HyperGrip rubber tracks, this bot is designed to clean in-ground pools of any surface. A distinct feature of this bot is that it offers four media types in one – standard and micro-filter cartridges, and oversized and disposable debris bags; making it the most sought-after and highly efficient robotic cleaner on the market. No matter what media type you choose you will end up with crystal clear water. Its 360-degree anti-tangle swivel cable and SmartNav pool surface scanning ability calculates an optimum pattern rather than hovering around the pool for efficient cleaning. The Primer is capable of reducing energy levels up to 90% with it DC energy-efficient 24-volt motor making it highly cost-effective. This universal caddy makes it easier to store and transport most Dolphin robotic pool cleaners. It comes with a slot that holds the pool cleaner and hooks to wrap the cords around preventing it from getting tangled up. 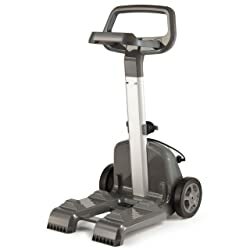 Very quick to assemble and reasonably priced, consider this caddy a necessary piece of equipment to keep everything organized and ready to go. The Polaris F9350 is a lightweight, modernized, 2-wheel robotic cleaner, fitted with Aqua-Trax tires which means it doesn’t have any problem maneuvering over any surface types including corners, steps, and walls. It features an incomparable navigation system that cleans your pool effortlessly and silently, regardless of the size of the pool. The bot uses an advanced technology called Vortex vacuum which contains a large capacity filter canister, enabling the machine to filter out fine particles and collect large debris without consuming too much time and energy. While there are less expensive cleaners out there, you have to take into consideration the strain Aquabot puts on better filtration. This robot has two filtration baskets that collect up to 190 cubic inches of debris; efficiently running for quite a while before having to empty them out. The control panel lets you program the bot to clean every 2 – 4 days and also adjust the length of the cleaning cycle ranging from 1 – 2 hours. It also sports an alarm to let you know when it needs to be emptied. The 360-degree swivel cable keeps the 60-ft long floating cable tangle free. Most suitable to be used for large in-ground and above-ground pools as it is quick and efficient. Some say it outperforms more expensive models at a lower price. The Solar-Breeze NX2 is the latest invention in the world of pool cleaning robotics. The distinctive feature of this bot is its ability to work without electrical power, as it relies on the power of the sub. This means you’ll no longer be bothered with twisted, tangled cables. It is fitted with a Lithium battery which stores solar energy throughout the day and works on sunlight around the clock preventing dirt and dust from settling on the surface and decay. The pool cleaner is also equipped with a smart navigation system for efficient cleaning of your pool. It comes with an in-built chlorine dispenser that evenly sanitizes your pool making it hygienic and sparkling clean. Although all machines require some degree of maintenance, the bots UV resistant shell ensures extended life. The Dolphin Escape is one of the best above-ground pool cleaners available on the market. With its huge debris holding capacity and ultra-light design this robotic pool cleaner a silent energy efficient pool cleaning genie. The dual scrubbing brushes and independent tracks get rid of even the stubbornest contaminants keeping your pool clean from every angle. 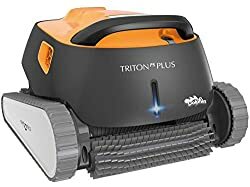 The Dolphin Triton Plus is perhaps Dolphin’s best robotic pool cleaner available online. Thanks to its innovative PowerStream Technology that propels water out in multiple directions it is able to create a constant grip that generates amazing cleaning results. Active brushes ensure even the toughest contaminants are removed from walls and floors. The Bluetooth capability makes this robotic pool cleaner even better as it allows the customer to operate the bot using their smartphones. 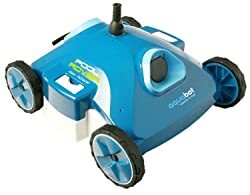 A great all-purpose robotic pool cleaner that is adept at cleaning large and medium-sized in-ground and above ground pools. 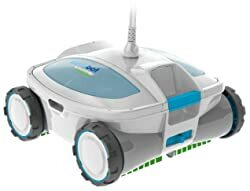 This intelligent robotic pool cleaner has a wireless handheld remote that is perfect for steering the bot in hard to reach places making it perfect for pools with stairs and other obstructions. Great for large pools as it cleans fast. With the quick clean option, this bot can complete a cleaning cycle in 90 minutes! The TigerShark is a dependable and efficient workhorse that has the capacity to scrub, vacuum, filter, and clean a pool’s walls, stairs, and floor in quick time. A state of the art robotic pool cleaner that is ideal for in-ground pool cleaning. The Dolphin Quantum has a massive 400-inch top-loading cartridge filter that is the largest ever fitted on a pool robot. Its rubber tracks and highly efficient DC motors make for superior wall climbing ability. One of Dolphin’s top of the line models the Quantum is fitted with SmartNav 2.0 software that makes for better navigation which means no getting stuck and no areas left uncleaned. Its dual scrubbing brushes combined with a Power Jet 3D Vectored Thrust system makes for a deeper clean that traps even the finest of particles. This bot is highly recommended for larger pools as it comes with a 60’ cable and an 87% more energy efficient motor which saves money and keeps the entire pool looking clean and beautiful. This bot is designed for residential above-ground and smaller in-ground pools. Equipped with an 80 gallon per minute Aquabot suction pump and fine filter inserts this relatively small but can easily clear up fine debris and even leaves thanks to its top access filter bag. This bot eliminates debris from the floor and lower walls and is also equipped with an adjustable axle pin to improve maneuverability in order to get maximize coverage. 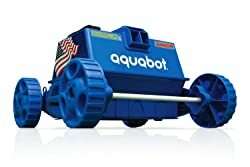 The Aquabot Pool Rover is a cost-effective solution for maintaining small to medium above-ground pools for under $500. 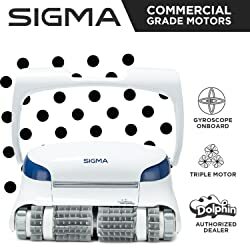 The Dolphin Sigma robotic pool cleaner takes robotic pool cleaning to a different level by using commercial technology in a residential pool cleaning bot. 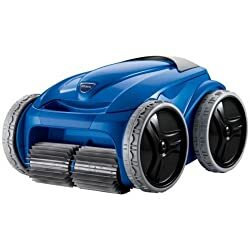 This is advertised as the terminator of pool cleaning bots and comes equipped with 3 high rpm motors that require 87% less energy than previous gen robots. The onboard gyroscope technology combined with independent tracks and massive dual filtration cartridges make this one of the best residential robot cleaners in the market. Gyroscope technology was only previously available in commercial units making this a revolutionary product for the residential market and sure to wow your neighbors! Two extra-large top access filter-baskets makes emptying between cleaning cycles simple and less frequent. This robotic pool cleaner is meant for cleaning residential in-ground and large above-ground pools. Equipped with two filter baskets, fixed scrubbing brushes and fine filter inserts helps ensure even the finest debris and dirt gets filtered through leaving pool water looking cleaner than ever and reducing the need for chemicals. Its patented power washing jet and 50’ swivel cord cable makes this product great for eliminating finer debris and dirt from pool floor and walls. A robotic pool cleaner is powered by a transformer and comes equipped with its own onboard pump and filtration system. They are capable of scrubbing and sucking up debris and dirt on the sides and bottom of the pool while increasing water circulation thanks to its own filtration and pump system. Automated features make robotic pool cleaners extremely efficient and reliable exceeding all other types of cleaners in terms of performance. They scrub, sweep and vacuum the pool. A suction pool cleaner, on the other hand, attaches to an existing skimmer and filtration system in order to extract debris from surface pool water. Suction cleaners are great for removing finer debris that collects at the bottom of swimming pools. This means that one has to scrub the pools walls and floor less often. Since a suction pool cleaner is dependent on an existing pump and filtration system, its performance and efficiency vary depending on the condition and reliability of the existing system. The suction cleaner also has to be manually hooked up to a hose that connects the suction cleaner to the system. When it comes to convenience and performance, then the robotic cleaner is by far the superior choice. However, suction pool cleaners are much cheaper and can be effective in their own regard. Pressure side automatic pool cleaners move around on wheels and use the pressure of the water either from a separate pump or with the existing pool pump to help propel them around the swimming pool. The water pressure helps force and keeps the debris in the bag. Pressure cleaners are excellent for picking up large debris such as twigs, leaves and pine needles. They come equipped with a tail that brushes debris off the floor and walls. Finer particles brushed off often do not fall into the bag which is one of the biggest cons of pressure cleaners. Robotic cleaners are the fastest and the most convenient all in one solution to pool cleaning and maintenance. However, after a stormy period pressure cleaners can be a great tool to clean up all of that fallen debris in relatively quick time and with minimum effort. Even the best robotic pool cleaner requires maintenance in order to operate at its maximum capacity. Here are some useful maintenance tips that are sure to get the best use out of any robotic pool cleaner. Always make sure to take out the cleaner from the pool once its cycle is complete. This will help in preserving the motor and making the pool safer for swimming. A robotic cleaner assists the existing filtration and pump system to derive better cleaning results. Making sure that the existing system is well-maintained is essential for increased performance from your robotic pool cleaner. After every use make sure you clean the basket and properly rinse the robotic cleaner to get rid of any chlorine or other chemicals that may be still on it. This will reduce wear and tear and the degradation of parts. If certain parts look like they may need replacement but are still working have them replaced. Worn out parts, especially simple things like the tires or skirts can make a huge difference to the performance of the cleaner when in good shape. Other tips include draining the cleaner of water and storing it out of sunlight after use. Taking care of simple things like this will increase the lifespan of your robotic cleaner and optimize its performance. This means less work and money spent leaving more time for poolside relaxation! How often should you use your robotic pool cleaner? 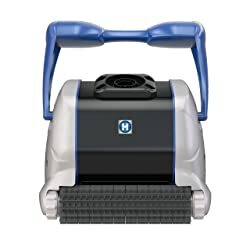 If you have purchased the right robotic pool cleaner for your pool running it for a couple of hours every other day should keep your pool looking clean and refreshing. Should you purchase the extended warranty? If offered, it is highly recommended to buy the extended warranty as robotic pool cleaners are expensive. Having an extended warranty for a slightly higher cost ensures that your investment stays safe for many years to come. Which are better lighter or heavier robotic pool cleaners? It depends on a lot of factors, but generally, a lighter robot tends to be more efficient and much easier to handle. Should I opt for remote control or caddy? A remote control feature is great if you have a large pool that sometimes requires special attention on a certain side more than the other. The remote control allows you to control the bot to exactly the right place giving it an intense clean. 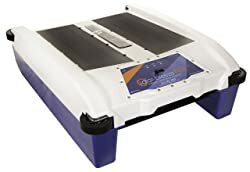 The caddy option is great for a robotic pool cleaner that weighs over 20 pounds as they can get extremely heavy after a cleaning cycle with all that water and debris. Robotic pool cleaners are by far the most convenient and effective ways of maintaining pool hygiene. By using hi-tech solutions, these bots now have the ability to clean an entire pool small or large with no supervision and minimal effort. Now you should know what is the best robotic pool cleaner on the market for your budget. The best robotic pool cleaners scrub, vacuum and clean all forms of contaminants and debris filtering the water to near perfect pool water conditions. This eliminates the need for heavy chemicals and regular cleaning and scrubbing as the robot takes care of it all. Robotic pool cleaners like the Dolphin Escape is perfect for above-ground outdoor pools. Its lightweight design couple with dual scrubbing brushes make it ideal in terms of both convenience and performance. 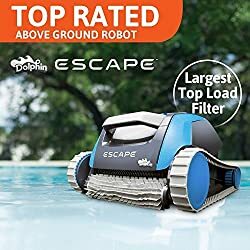 The Dolphin Escape is reasonably priced and with its extended warranty is one of the best robotic pool cleaners for above ground pools that won’t break the bank and offer relaxation whenever needed!